The small scale of these two bronze sculptures makes you want to hold them in your hand and feel the cool bronze that once was malleable clay. Ironically, it was a fingerprint, captured forever in an art work, that finally helped illuminate their true authorship. Willem de Kooning (1904-1997) was an American Master of Abstract Expressionism and a friend of Philip Pavia, whose archive of abstract expressionist art came to Emory in 2005. 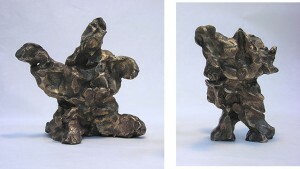 In the 1980s, when Willem de Kooning was already suffering from Alzheimers, Pavia was asked by the family to retrieve some clay maquettes (two figurines) and a plaque from de Kooning’s studio and cast a series in bronze. When the artist was declared incompetent, the estate lawyers denied that these works were actually de Kooning’s, and the insulted Pavia sued. Natalie Edgar, also an artist and Philip’s widow, donated to Emory the two Leda and the Swan sculptures, Leda and the Swan Sitting and Leda Embraced by the Swan, as well as the legal files pertaining to the lawsuit she and Philip Pavia brought against the Willem de Kooning estate in 1993. The most thrilling testimony from the files is that of the fingerprint expert who confirmed Willem de Kooning’s involvement in creating the clay forms. In acknowledgement of the controversy, the works are credited to ‘Studio of de Kooning’. The hope is that these recognizable sculptures from such a well-known artist will draw researchers into the wealth of treasures still waiting to be uncovered in the Philip Pavia and Natalie Edgar archive of abstract expressionist art, 1913-2005: Club records, the IT IS journal files, letters, photographs and personal papers from a golden era of the New York City art scene.